Sophomore pitcher Paige Smith slugged a home run over the left-center field fence in the fourth inning and it proved to be the gamewinner when Sparta edgd Mount Olive 2-1 on Friday, April 8. The Spartans (3-0) took a 1-0 lead in the first inning. Gretchen Bowie walked and eventually scored on Courtney McKenna's fielder's choice. Mount Olive (2-1) scored its lone run in the fifth inning courtesy of Alyssa Borozan's two-out homer to center field. Smith earned the pitching victory with a three-hitter. She struck out seven and walked two. Alyssa Mathura and Taylor Beck had the other hits for the Marauders. Allie DePuyt rapped out four hits, including the 100th of her career, and Larissa Spellman tossed a one-hitter to propel Butler on Friday, April 8. DePuyt knocked in two runs and scored twice. Spellman struck out 18 strikeouts walked two. Jessica Ratz had the Colts' only hit. Nicole Petrovich, a senior shortstop, had two hits to help the Hornets to a win over Madison on Friday, April 8. One of Petrovich's hits was a home run and was the 100th hit of her career. Petrovich's junior sister, Amy, added three hits and knocked in five runs. Alex Cosenzo (3 for 4) also homered for Hanover Park. Jess Miller gave up four hits and fanned six to earn the pitching win. Caitlyn Massaro, Grace Nittolo, Mitra Sharif and Alyssa DeBiasse had hits for Madison. Rachel Sweetser's three-run double highlighted a four-run second inning for the Golden Eagles (3-1) on Friday, April 8. In the fifth, Morris Knolls got the rest of its runs on Morgan DeLoreto's RBI double, Nicole Reilly's RBI double and Jess Heitmann's run-producing single. Brooke Wiarda went the distance, striking out six and walking three. Jocelyn Johannessen hit a double for West Morris (0-4). Madison Amdur and Katlyn Lloyd drove in two runs apiece for the Gaels when they triumphed on Friday, April 8. Amdur drove in her runs with a double. Kayla Corrente notched the pitching victory with a five-hitter. She struck out three and walked three. Hannah Ververs plated two of the Vikings' runs with a single. Whippany Park erupted for seven runs in the fifth inning on the way to a come-from-behind win over Friday, April 8. The Wildcats' 14-hit attack was fueled by Rachel Grabowski (2 hits, 3 RBIs), Catherine Davidson (3 for 3, two RBIs), Catie Ferullo (2 doubles) and Ashley LoBell (2 hits). LoBell scattered five hits while striking out four. Sarah Reed singled, homered and finished with two RBIs for the Bombers. The Rams rode Michelle McMillian's four hits and two RBIs to a win over Morris Hills on Friday, April 8. Another offensive standout was Lindsay Danias (2 for 2, HR, 3 RBIs). Kristen Lindquist went six innings, yielding three hits, for the Rams. Lindquist also had two hits. Cat Rewick had three hits for the Scarlet Knights and Beth Kehrley drove in a run. Caitlin Brennan pitched a three-hitter, striking out six, and helped herself with two hits, including a double, to lift the Red Hawks over the Lakers on Friday, April 8. Sarah Waffenfeld also had two hits and knocked in a run. Erika Gripp ended with two RBIs for Parsippany (3-1). Jess Torch stroked two hits for the Lakers. Alyson Hine laced three hits, one of them a homer, knocked in a run and scored three times for the Falcons on Friday, April 8. Dianna Gatto also homered. Gatto singled and doubled as well, knocking in two runs. Carly Wurster added three hits in support of Alexa Pettit. Kittatinny leadoff batter Allison Westra doubled and singled. Sara Seuffert and Katie Wright combined for a three-hitter for Morristown-Beard on Friday, April 8. Gianna Rella had two hits and Zoe Grebin doubled and drove in two runs for the Crimson (2-2). Gabby Bubba held Vernon to one hit, struck out six and the Lions rolled to victory on Friday, April 8. Jess Esso powered the offense with four RBIs. Kayla Hillenbrand chipped in with two RBIs. Amber Powers went 3 for 4, including a double. A four-run fifth inning, which featured a two-run base hit by Daniella Saggio, boosted Parsippany Hills to victory over Randolph on Wednesday, April 6. Julia Puchalski scored the other run in the inning on an error. The win was the first for new Vikings coach Alex Hill. "It was nice to get it out of the way," Hill said. "It also was nice to get the first loss out of the way. Now, we can just play." Hill noted that her players were upbeat and positive and had put an opening-day shutout to Pope John behind them. "The girls played so well," Hill said. "They were tight against Pope John in our opener. We worked on some things. They were more loose and excited. It showed in the way they played." Parsippany Hills (1-1) scored a run in the second inning on an error and Kaila Rosamilia's run-producing base hit. Hannah Ververs doubled in the inning and scored. In the fifth, the Vikings filled the bases on an error and singles by Corinne Davis and Krissy Baxter. Jaclyn Carifi (two hits) drew a walk to bring in a run before Saggio knocked in a pair of runs with a single. Rosamilia, a junior, pitched a four-hitter and struck out two. The Rams (1-2) received RBI base hits from Nicole Ferry and Morgan Ryan. Randolph starts only one senior, catcher Rachel Fennell. There are four freshmen and two sophomores among the starting nine. "We're very, very young," Rams coach Ashley Kanya said. "It's going to take awhile. We didn't hit today. We've been struggling offensively." The Marauders, behind Alyssa Borozan's three hits and RBI, defeated the Lions on Wednesday, April 6. Alyssa Mathura and Elise Enslin had two hits apiece and each drove in a run. Borozan, a sophomore, went the distance, striking out two and surrendering six hits. Larissa Spellman had three hits, including the 100th of her career, and was the winning pitcher when the Bulldogs blanked St. Elizabeth on Wednesday, April 6. Among Spellman's hits was a double. She struck out eight over four innings. Allie DePuyt (4 for 5) and Sam Beck and Kellie Faber, who had three hits apiece, were additional offensive standouts. Sarah Stubeck's two-out triple provided the Cougars with their lone run in the fifth inning in action on Wednesday, April 6. Hallie Pellegrin scored the run after reaching on a miscue. Melissa Landry picked up the pitching victory with a one-hitter. Julia Buckley was dominant for Mendham, striking out 16 and yielding two hits. Jessica Miller smacked a double and knocked in three runs for Hanover Park on Wednesday, April 6. Amy Petrovich, the cleanup hitter and second baseman, also doubled. She had two RBIs for the Hornets, who erupted for six runs in the second inning. Claudia Bennett homered for Parsippany. Mackaella Goodwin homered and Caitlyn Massaro had three hits to pace the Dodgers on Wednesday, April 6. Massaro finished with one RBI. Jenna Tierney contributed two hits and drove in two runs. Montville's Jordan Strickland stroked two hits. Isabel Seise (2 hits, 3 RBIs) and Chelsea Bitondo (2 for 5, RBI) had big days at the plate to power Jefferson on Wednesday, April 6. Other players contributing to the attack were Nicole Vassallo (3 hits), Carly Wurster (2 hits) and Kylee Hine (home run). Alexa Pettit struck out four over six innings and gave up three hits to notch the pitching victory. Gina Formisano had two hits and knocked in four runs for the Gaels on Wednesday, April 6. Emily Song reached base five times, rapping out four hits and drawing a walk. Olivia Farachi homered for the winners. Song, the winning pitcher, struck out 10 and surrendered six hits. 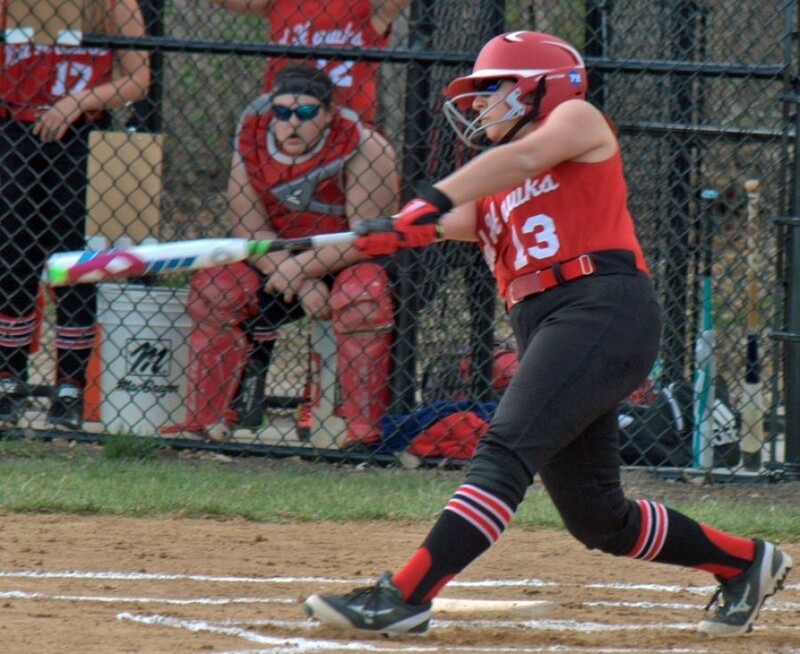 Three hits, two of them home runs, by Alexa Saccomanno propelled Kinnelon on Wednesday, April 6. Saccomanno knocked in four runs. Samantha Schwed and Emily Kapr also homered for the Colts. Schwed and Kapr had three RBIs apiece. Sierra Jacko struck out five in three innings of work for Kinnelon. Caitlin Brennan, a junior right-hander, gave up five hits and struck out 10 when Parsippany shut out Morris Knolls 2-0 on Tuesday, April 5. The Red Hawks (2-0) got their first run in the third inning with two outs. Luisa Barone singled and Claudia Bennett followed with an RBI base hit. In the top of the sixth, Alivia Mercuro led off with a single and came around on Angelica Link's single. Allie Schey rapped out two hits for Morris Knolls (2-1). Brooke Wiarda (7 hits, 4 Ks) absorbed the loss. Sarah Stubeck's two-out single with the bases full highlighted the fourth inning for the Cougars on Tuesday, April 5. Bonnie Kennedy and Hallie Pellegrin had doubles for Chatham. Kennedy had the other RBI. Winning pitcher Melissa Landry gave up four hits. The Tigers blanked Mountain Lakes behind Molly O'Brien's four hits and five RBIs on Tuesday, April 5. O'Brien doubled twice and slugged a home run. Kayli Yeisley also had four hits, including two doubles, and knocked in four runs. Genny Madarasz had two hits and knocked in a run for Mendham on Saturday, April 2. Courtney Gionco and Ellie Seminara also had RBIs for the Minutemen in support of Julia Buckley (7 Ks). Natalie Decena led the Gaels with three hits. On Monday, April 4, the Golden Eagles rode Emilee Stone's bat to a shutout of the Rams. Stone hit a grand slam and RBI base hit and finished with five RBIs. Danni Caby and Danica Lee had RBI singles for the winners. Brooke Wiarda was nicked for two hits and struck out six. The Rams' hits came off the bat of Jennifer Iantosca. Meg Leitner snapped a 2-2 deadlock in the sixth inning of this game on Friday, April 1 when she tripled with the bases loaded and two outs. The game was halted after six innings because of rain. Caitlin Brennan struck out 10 and walked one to earn the pitching decision. Gretchen Bowie had two hits and drove in what proved to the only run for the Spartans in the third inning on Friday, April 1. Paige Smith's complete-game four-hitter was another key factor for Sparta. Smith struck out seven. Natalie Decena had a pair of hits for the Gaels.